STEP 1 -- REGISTER YOUR SCHOOL. Click the REGISTER button to your right. To see who has currently registered on your team, click VIEW TEAMS on the left side. *You must register as a Team, Club or Organization. *If you are new to the Program, please be sure to email me or call and I can walk you through the process. Students need to be aware of their Team Leader and their Team/School Name. STEP 2: We will provide you with the registration package with complete details. Starting March 11th, Team Leaders will receive weekly Eblasts with running tips, nutrition tips, videos, updates and more. STEP 4: The leaders receive a weekly email with program details, nutrition tips and other items. Run Jump Throw Wheel (RJTW) is a national program sponsored by The Hershey Company and developed by Athletics Canada that teaches fundamental movement skills and develops physical literacy. Using track and field inspired games, activities and skill challenges lead by instructors specifically trained to teach the fundamentals of running, jumping, throwing and wheeling (for children in wheelchairs). Our goal is to provide a physical activity program that serves as a strong foundation for all sports. RJTW assists children in learning to move more efficiently so that they grow into athletes who are active, productive and healthy citizens. Sask Athletics is excited to offer 2019 MaraFUN participants another unique chance to come play and try-out the Run Jump Throw Wheel (RJTW) obstacle course after you cross your race finish line and get refreshed at the snack station. Certified program instructors who are also awesome role models will be on site to guide you in this fun and inclusive environment with activities such as sprints, hurdles, jumps, turbo javelin, bean bag shot put, and relays. The fun is also free and available to any children aged 6-12 years on-site on race day who were not registered for the MaraFUN. To participate simply fill out a waiver on-site and join in! No previous experience with track & field background necessary. Hi Everyone! Marafun 2019 is just around the corner, and I hope you are ready for an amazing day! There will be over 1500 students running at this year’s event on Sunday, May 26th, and we are hoping for some great weather! In order to make this day successful, we have a Race Day Handbook that should answer any questions that you may have. - The runners will start in Diefenbaker Park. They will cross the finish line along St.Henry Avenue behind Prairieland Park. The course is 2.2 km’s in length. 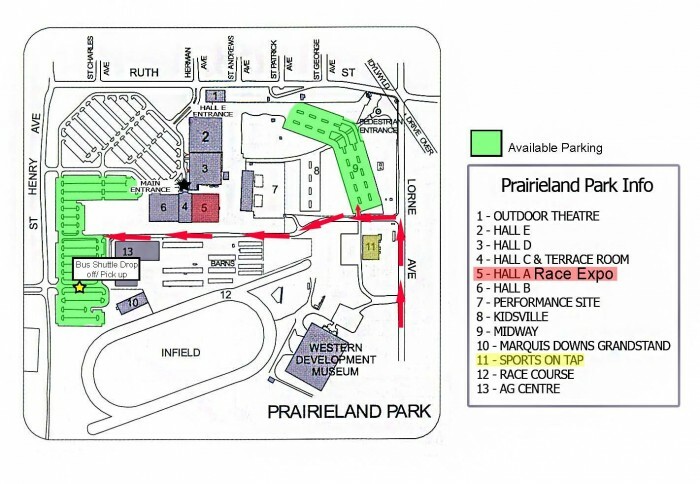 - For Parking, we suggest parking in the Prairieland Park parking lot. The ONLY way to enter the parking lot is from Lorne Street, through the Sports On Tap Parking lot (see end of document for map). - Please meet us in Diefenbaker Park prior to the race. There will be signs marking the location and please feel free to ask any volunteers (wearing red shirts) Look for the Boston Pizza tent. The volunteers at the tent will guide you where to go. - At 10:30 am, all the race participants will be invited to come to the middle of the park for a group photo followed by a warm-up. Leaders, please feel free to stay on the field and assist us in controlling the students. Parents, we ask you to move to the edge of the park to facilitate our crowd management team. -Volunteers will hold signs noting Grade Groups and the students will be asked to make their way to their respective group. -If you have siblings who want to run together, please use your discretion with this. The reason we are dividing the students into groups, is so we can avoid chaos on the course. If a grade 8 wants to run with a grade 3, put the grade 8 into the grade 3 group and talk to them about being gentle around the smaller runners. - Volunteers (Course Marshals) will be positioned along the course to direct the runners. - About half way through the course, a Water Station is available for the runners to grab water. Please remind your runners to watch for others when they are grabbing water, and to be cautious of others throughout the run. - The runners will be asked to stay on the right side of the road while running to the finish line. Again, there will be volunteers directing them. - The runners will finish on the right side of the finish gate, and will be rewarded with a medal. - Once each student finishes the race and receives their medal, they will be directed to the Post Race area of the Finish Line. - There is a separate Marafun Food Tent located near the finish line and each student will be allowed enter the tent once. Only runners are allowed in the FOOD TENT. - Parents can meet their children after the race BEHIND THE FOOD TENT at the designated meeting point. - Marafun participants should not bring any valuables to the race. - If you are taking a bus to the event, the best spot to be dropped off will be in the Prairieland Park parking lot, or near Diefenbaker Park. - Please feel free to take as many pictures as you would like at the event. It is a day to celebrate a great achievement! - There will be no timing of the Marafun participants. - Please have your runners dress for the weather. On a cold day, layering your clothes is the best thing to do. - Please wear your Marafun t-shirts to the event. The race bib is incorporated into the t-shirt. We hope you have had fun decorating them and making them your own. We can’t wait to see them! - Remember, every student is here to complete the 2.2km’s. Please keep your comments positive and encouraging! - If leaders must run with your respective runners, please limit the number of non-participants on the course. This is the students’ time to shine. We would like to thank everyone for making Marafun 2018 such a success! It has been such an incredible year, having over 42 schools, and 1550 students take part. The Marafun is a program that has been developed by the SRRA in conjunction with the Saskatchewan Marathon. The Marafun will provide the opportunity to approximately 1,600 young people (13 and under) to participate in the Saskatchewan Marathon in a novel way. Each Marafun participant will run, walk, or wheelchair a minimum of 4 Km per week in the weeks leading up to race day. Marafun participants will cap off their hard work with a fun run on part of the marathon course on race day. The cost of this program is $15.00 per student + GST and service fees, which includes a t-shirt and a medal! Throughout the program, there will be opportunities for the participants to learn about an active lifestyle, maintaining a physical activity program to promote health, and the importance of having personal goals. It is truly a unique way for kids to increase their activity levels, nutritional knowledge, and self esteem.